A super bright 14 LED aluminium flashlight with a push button On/Ofswitch. Includes a strap and 3 AAA batteries packaged separately. Price includes choice of laser engraving or one colour pad printed logo. We recommend laser engraving. Individually packaged in a white box. SKU:L-705. 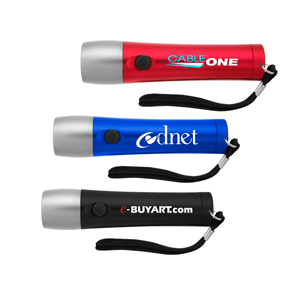 Categories: Torches, Promotional Merchandise.